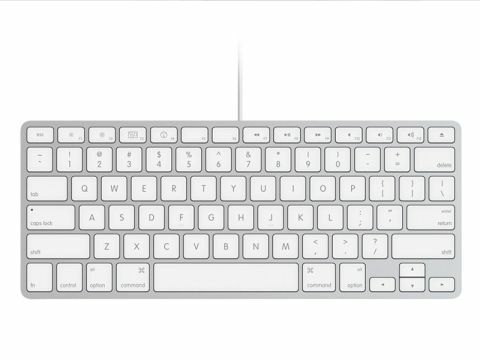 Our initial reaction to Apple's new compact, wired keyboard was 'why bother?' Surely everyone who wants a compact keyboard (with no number keypad) would buy the wireless version, and everyone who wanted a cabled keyboard would opt for the one with the keypad. Having given it a go, though, we can see it from both sides. The new keyboard offers advantages over both existing models, so let's look at a few of them. The obvious advantage of a compact design is that it takes up less room on your desk and therefore it's also easier to stash, freeing up space for you to do something else. If desk space is more important to you than a numeric keypad, or you simply want the same keyboard configuration on your desktop as you use on your laptop, then the compact model is for you. But why would you go for the USB version over the Bluetooth model? Granted, it's £20 cheaper, but there are other reasons than simply saving a few bob. The advantage of the wired keyboard is that it doesn't require batteries, plus it offers two handy integrated USB hubs for you to plug a flash drive, camera or other peripheral into. Given free reign of all Apple's keyboard options, we'd opt for the wired keyboard with the number pad. In fact, we'd be miffed if we bought the new iMac without realising the compact version comes with it. You can swap it for the larger version for free if you buy at the Apple Online Store, but if you get your Mac from a retail shop you can't. This new keyboard performs well. All Apple keyboards are responsive and have a very light key action that we love. They're ergonomic, stylish and offer a good range of media keys. Ultimately, all the choices in the range are excellent keyboards.